Tuesday was our last swim of the year (I am not counting a visit to the swimming pool yesterday, which was warm and chemical). At Vobster, we ended on a high note of December sunlight, an exceptionally mild 10 degrees, and Fiona’s chocolate caramel shortbread. The two figures in the foreground are Ruth and me though, because I rather thought our swimming attire looked jolly together, and I have amusing writing across my new swimming costume bottom, especially designed and ordered by Plum for a relay race next month. On the front of it there are appropriate snowflakes, but it’s barely even cold yet! 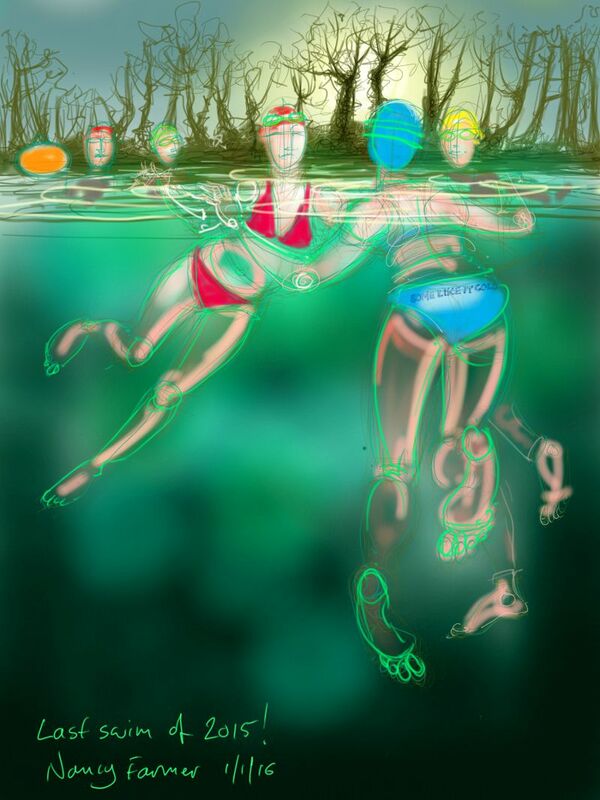 This entry was posted in Events, swimming and tagged art, cold water swimming, drawing, life drawing, open water swimming, sketch, somerset, Vobster Quay on January 1, 2016 by Nancy Farmer. 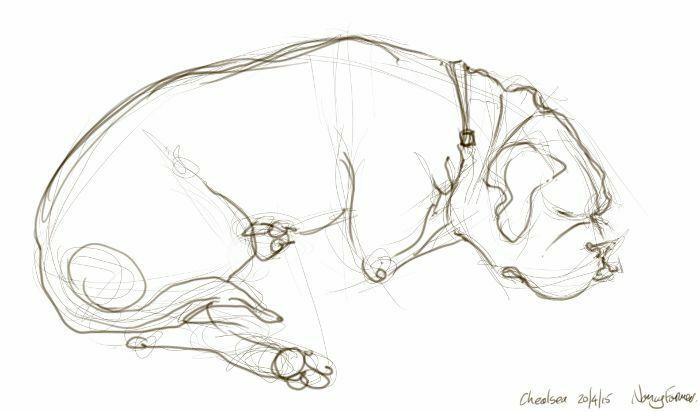 Is it me or is it suddenly very quiet here? 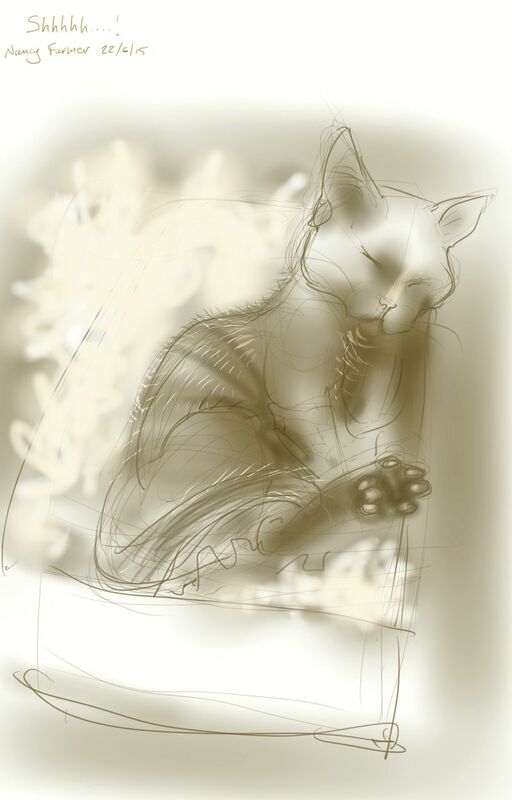 This entry was posted in Cats and tagged cat drawing, cat sleeping, cat-of-the-day, drawing, Freyja Kitten, kitten, life drawing, sketch, sleeping kitten on June 22, 2015 by Nancy Farmer. 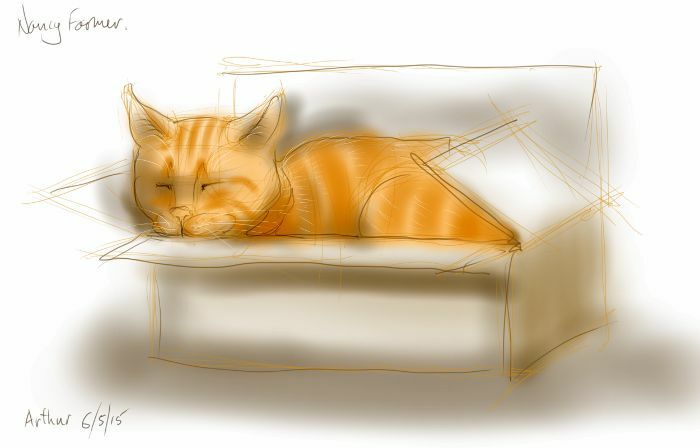 This entry was posted in Cats and tagged art, arthur cat, cardboard box, cat drawing, cat in a box, ginger cat, illustration, life drawing on May 7, 2015 by Nancy Farmer. 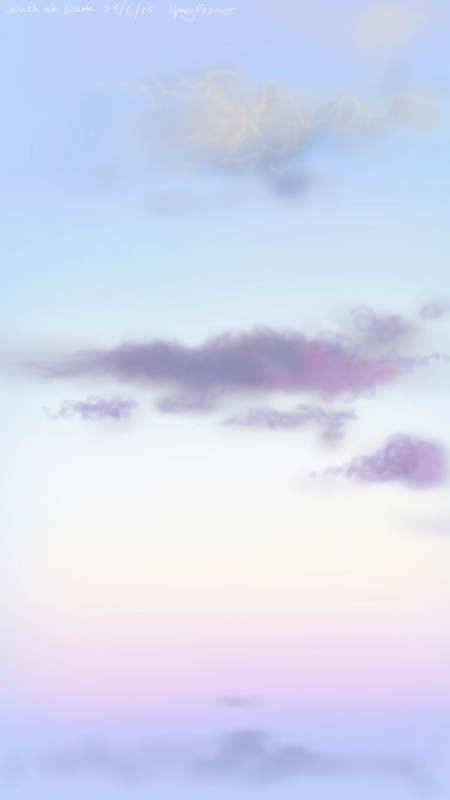 It looked a bit like this, just 20 minutes ago. 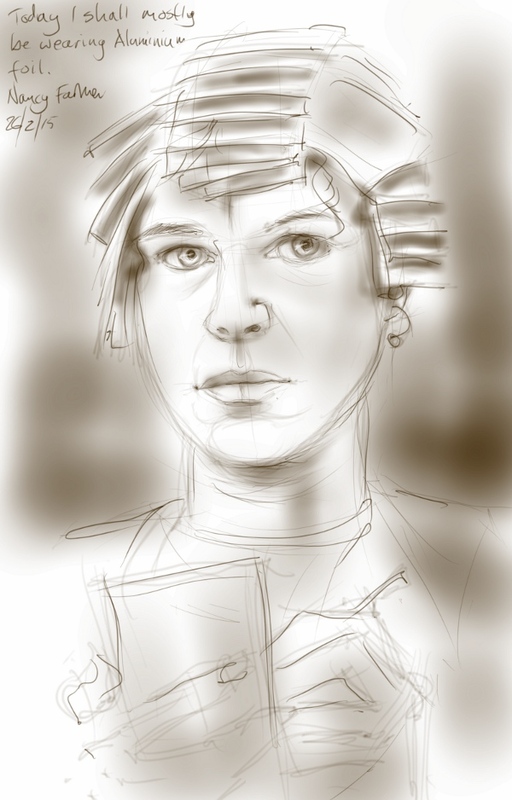 This entry was posted in Places and tagged art, clouds, digital painting, drawing, illustration, life drawing, sketch, sky, sunset on April 29, 2015 by Nancy Farmer. Percy is flashing his toes whilst having a wash. It’s probably very provocative in cat-language. 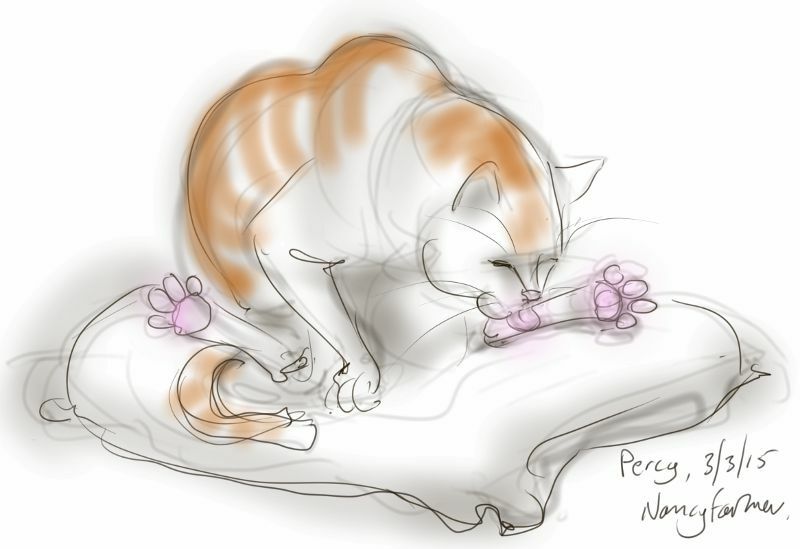 This entry was posted in Cats and tagged art, cat drawing, cat washing, cat-of-the-day, digital sketch, drawing, ginger and white, illustration, life drawing, Percy Cat on March 3, 2015 by Nancy Farmer.